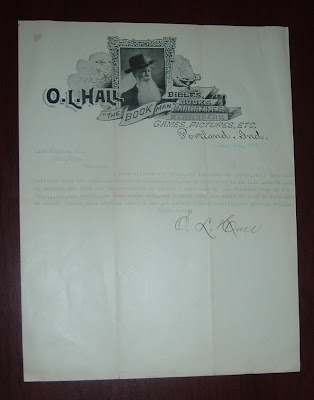 Here's a letter from an Indiana bookseller in 1907, more notable for its letterhead than anything else I can find about its author. 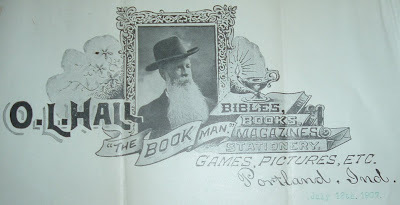 In addition to books and Bibles, The Book Man sold magazines and stationery along with games, pictures, and miscellaneous items. O.L. Hall, who billed himself as "The Book Man," typed this out, perhaps from his book shop, one summer day more than a hundred years ago in Portland, Indiana. 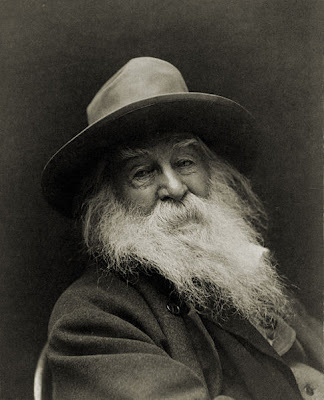 His Walt Whitmanesque pose (Whitman below) makes for an impressive centerpiece in his letterhead. I have written you twice, and received no answer and I have been informed that the business has been discontinued, but it does seem to me that someone gets my letters for none has been returned to me, and I want some of the Township Maps of this County, Jay, and would like these right away, and I think some one would be glad to make them, so kindly answer this stating where I can get some orders filled promptly, and graetly (sic) oblige. I doubt he ever got his maps from the defunct company, but I'll give him a few points for stubborn persistence. Ramon Adams and "the work of an idiot printer"
Ramon F. Adams was a prolific author, bibliographer and lexicographer on the subject of cowboys, range life, and the American West. The "idiot printer" is Bill Wittliff (he wrote it, not me! see below), whose Encino Press published this piece shown below in 1967. Mr. Wittliff's inscribed bit of self-deprecating humor graces the backside of a piece of printed ephemera from my recent acquisition of Wittliff/Encino Press material. Why Wittliff refers to himself this way, I'm not sure. An inside joke peraps, or just his sense of humor. Whatever, I'm glad he added this personal touch. It made me smile. I know it's his writing because all the other pieces in the batch of his epehemera I obtained have his handwriting in either initials or signed inscriptions. 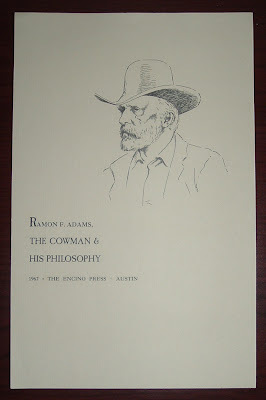 This appears to be a mock-up or announcement of some sort for the forthcoming book by Ramon F. Adams: A Cowman & His Philosophy. The Ramon Adams Collection at the Texas/Dallas History and Archives, Dallas Public Library offers a biography and detailed listing of its contents. Although, this collection contains a lot of material around the time this book would have been published, including correspondence with the Encino Press, I could find only one reference to this particular book: "a book of the cowman's philosophical sayings." Here's a nice descriptive piece about printed ephemera, which I was pleased to receive from William R. Holman. It was a nice surprise and most appreciated. I tried fitting it into the side column for permanent display, as its wordsmithing is most appropriate for this blog. But it just wasn't readable scaled down to fit. So here it is in a regular post, which is better than not sharing it at all. Enjoy! Mr. Holman's memoir, The Orphans' Nine Commandments tells the incredibly poignant story of what a young Oklahoma boy had to overcome during the Great Depression to find success in life as an innovative librarian, award-winning book designer, printer, publisher, and writer. 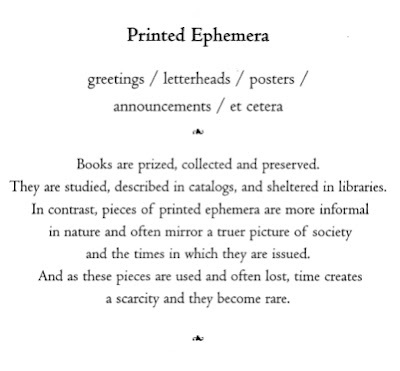 I feel honored that he shared with me his thoughts about printed ephemera. Thanks again, Bill. Cataloging books the other day, I came across an 1890s multivolume set called Messages and Papers of the Presidents. Inside one of the volumes was a slip of printed paper with a bookbinder's message: How to Open a Book. The set was published by the Government Printing Office, so they are the likely source of this piece of paper, which reprints a passage from a publication titled, Modern Bookbinding. No other bibliographical detail is included for that title, but I have found a magazine from that era, Modern Bookbinding and Their Designers. No clue, though, as to the author of this particular piece. You might wonder (I did) why there would be a need for instructions to open a book. And if you put those instructions inside the book, doesn't that defeat the purpose somewhat? Hold the book with its back on a smooth or covered table; let the front board down, then the other, holding the leaves in one hand while you open a few leaves at the back, then a few at the front, and so on, alternately opening back and front, gently pressing open the sections till you reach the center of the volume. There's more, but let's stop here and reflect on that passage. The rest has little to do with procedure anyway. I think this has to do with new books with fine (delicate?) bindings where you need to exercise the binding a bit and work out the stiffness. I believe the author means for you to place the book's spine on a clean, smooth surface, let the front cover down and then the back cover. Alternate the front and back pages in the same way till you reach the middle of the book. Do this two or three times and you will obtain the best results. Open the volume violently or carelessly in any one place and you will likely break the back and cause a start in the leaves. Never force the back of a book. "A connoisseur many years ago, an excellent customer of mine, who thought he knew perfectly how to handle books, came into my office when I had an expensive binding just brought from the bindery ready to be sent home; he, before my eyes, took hold of the volume and tightly holding the leaves in each hand, instead of allowing them free play, violently opened it in the center and exclaimed: 'How beautifully your bindings open!' I almost fainted. He had broken the back of the volume and it had to be rebound." I guess I've never handled such a fine binding in so "violent" a manner that I could have broken its binding. Who opens a book that way? Sounds to me like you'd have to get pretty rough with it to cause that kind of damage. Then again, I don't really know enough about the intricacies of fine bookbinding. But I thought this was an interesting piece of ephemera to write about. Its content is something I never would have thought about, in terms of a proper and somewhat laborious procedure for opening a book. My procedure is to just pick the book up, hold in right hand, and use the left hand to open the front cover and following pages to where you want to start reading. I haven't broken a binding yet with that procedure. Back to my small collection of William D. Wittliff ephemera (started with this post), here is a piece published by Wittliff's Encino Press in 1966. 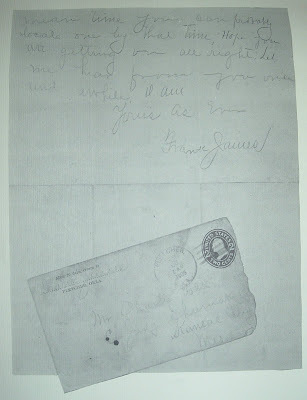 It's a four-page brochure, for lack of a better description, that presents a two-page letter written by Frank James, brother of the infamous outlaw, Jesse James. Most everyone has at least heard of Jesse James. Frank was Jesse's older brother. Together, and with other members of their gang, they robbed banks, stage coaches, and murdered. After Jesse was murdered himself, Frank turned himself in and was acquitted at a trial for murder. He went straight afterward, working in a variety of jobs, including shoe salesman, ticket taker at a theater, and telegraph operator. He later made money off his criminal past with lectures and tours of his farm that included the grave of Jesse James, who had become a legendary figure of the Wild West after his death. As a child, James showed interest in his late father's sizable library, especially the works of William Shakespeare. Census records show that James attended school regularly, and he reportedly wanted to become a teacher. The Civil War tore apart the state of Missouri, where the Jameses lived. The brothers were swept up into guerilla warfare and involved in several atrocities under the guise of war. After the war ended, their way of life continued with gangs and crime. Had the Civil War been averted, and relative peace continued in Missouri, I wonder what influence that library of Shakespeare volumes might have had on a young Frank James? The war, of course, didn't excuse the actions of Frank and Jesse James. Plenty of others in the state were caught up in similar circumstances and did not resort to the lifestyle adopted by the James brothers. Interesting to ponder, though. 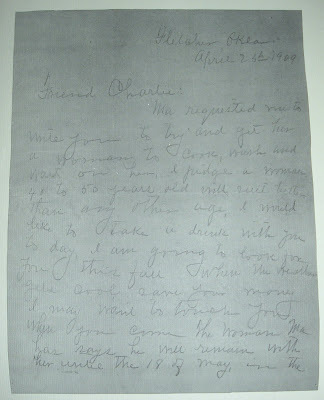 The letter that Bill Wittliff printed is a letter from Frank James to a friend, Charlie Polk, seeking domestic help for his mother. To which has been added an enlightening Afterword by William D. Wittliff. Number One in a series published con mucho gusto for especial friends of the Encino Press who might delight in a bit of occasional nonsense. You see, he weren't all bad. Probably the best thing I've written--Bill Wittliff. I liked the humor con mucho gusto! According to WorldCat.org, only three copies of this printed letter exist in library holdings, all universities in Texas: Texas A&M (College Station), University of Texas (Austin), and Baylor (Waco). WorldCat also describes the format of this piece as "Book," which it clearly is not by most definitions of a book. Whatever you want to call it, it appears to have had a limited printing and distribution. I've got number four. Any others out there? As I have posted recently about a few pieces in my ephemera collection related to book design and the printing arts, particularly in Texas, I thought I'd share this link: The Handbook of Texas Online - Printing Arts for anyone interested in more information on the subject. This page from the Texas State Historical Association site offers an overview of printing history in Texas through biographical sketches of the state's greatest practitioners of book design and fine printing. For further reading: The Printing Arts in Texas, by Al Lowman, published by Roger Beacham (William R. Holman's imprint), 1975. With all the horrible news coming out of Haiti recently because of the devastating earthquake, I remembered a bit of history I learned about the country via the bookplate below. I wrote about it on another blog more than three years ago and it seemed timely to revisit it now and rework it for this blog. This is one of the more interesting bookplates I've come across in recent years. It depicts Haiti's first military force, the Gendarmerie d'Haiti, which was established in 1915 during U.S. occupation and commanded and supported by U.S. Marines. Quite likely, the previous owner of the book had been a U.S. Marine in the Gendarmerie d'Haiti during that time. I found the book at a Houston Public Library sale several years ago and, though it looks battle-worn, I bought it for the author's inscription inside and because of my interest in the subject. The book is American Ballads & Folks Songs, by John A. Lomax and Alan Lomax (Macmillan, 1934), first edition, inscribed by John Lomax. So you see, the book with the Lomax signature justified the purchase. The bookplate topped it off. The bookplate design has several features. There is a fort on a hill with an ominous looking cloud behind it. Behind the cloud is a depiction that could be interpreted as brilliant rays of sunshine. Below the fort is a palm tree flanked by flags and cannons (Gendarmerie d'Haiti insignia). A banner runs beneath the palm tree and is inscribed with "Capt. Harold" and "Ray Wood" on opposite ends. In the middle of the banner are the words, "Gendarmerie d'Haiti." At the base of the bookplate, a solid row of books seem to act as a bulkhead against the sloping terrain below the fort. So what about Capt. Harold and Ray Wood? I just can't seem to get a handle on Capt. Harold, but I suspect he was Ray Wood's commander. Finding information on Ray Wood was easier, thanks to the Houston Metropolitan Research Center, Houston Public Library's Web page for The Ray Wood Collection. Turns out that Ray Wood (1889-1964) was a writer for the Houston Chronicle, specializing in folklore, an interest that led to writing two books: Mother Goose in the Ozarks and Mother Goose in Texas. Now I can make a connection to his interest in Lomax's work. Wood, or his family after his death, donated his papers to the Houston Public Library, where the 20 linear feet of materials comprise 32 document boxes. 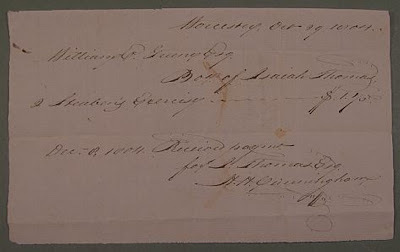 In the summary of his inventory, I noticed correspondence and other papers regarding his having received the Distinguished Service Medal, Haiti. I'll bet somewhere in those papers is a reference to Capt. Harold. As for Raywood, Texas, there is nothing in the inventory summary that indicates Wood lived there, but a map of Raywood is among the donated papers (Box 8, Folder 3). Perhaps he was intrigued with the notion of a small Texas town sharing his name. I don't know for sure, but I'm intrigued enough that I think a trip to the Houston Public Library is in my future. 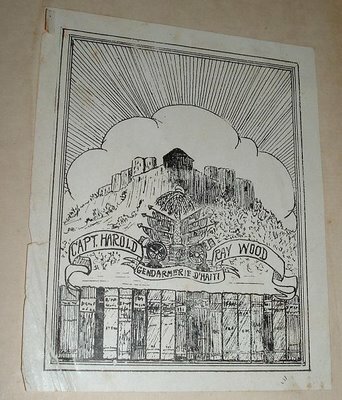 Some writing on the front free endpaper, opposite the bookplate, might yield a clue about Ray Wood. His name is written there, followed by Raywood, Tex. Raywood, Texas is situated along the old Beaumont Highway east of Houston. According to TexasEscapes.com, it was named for Raymond Harwood, proprietor of the local rice mill in the late 1800s. If Ray Wood didn't live there, I wonder why he would write the town name in his book beneath his name? Perhaps he did live there, or liked to claim he was from there, as a joke. I really need to get down to the library and dig through the Ray Wood Collection to answer a few questions. About the Gendarmerie d'Haiti there is much, and much is not favorable toward the American presence. Another creation of the Americans in Haiti, although it is now improved in personnel and leadership, fanned the flames of hatred and violence which swept the island. I refer to the Gendarmerie d'Haiti. This is a military force of black men, officered with one or two exceptions by corporals and sergeants of the Marine Corps promoted to lieutenancies and captaincies over Haitians. Many of the white men were ignorant and brutal. Some of the Haitians enlisted in the gendarmerie were notorious bad men. Several of them have been shot for murder and extortion among their own people. But researching the Gendarmerie d'Haiti also led me to the biography of U.S. Marine Major General Smedley D. Butler, a larger-than-life hero, and then the biography of the most decorated U.S. Marine in history: Chesty Puller. There is interesting history all around this topic and one final site of historical interest reveals some photographs from Haiti during the American occupation of 1915-1934. Some pretty remarkable images. And its pretty remarkable what an old bookplate might reveal, hiding inside the tattered covers of an old book. I recently purchased a batch of ephemera having to do with William D. (Bill) Wittliff and his Encino Press in Austin, Texas--pieces he designed and printed. Several pieces seem a good fit for the content of this blog, so the book-related ones will be featured here during the next week or so. Up first, The Collectors' Institute. 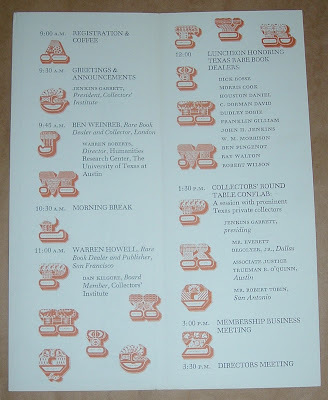 This is a program designed by Bill Wittliff for the Second Annual Meeting of the Collectors' Institute. 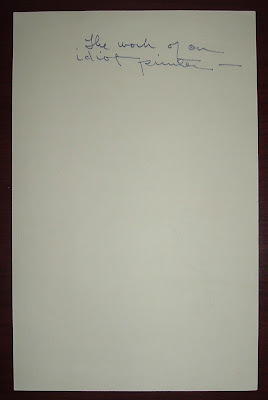 Wittliff signed (initialed) the back of the program. I had never heard of this group before, so I did a little research to see what it was exactly and what became of it (assuming it is no longer around). The Handbook of Texas Online has an article on the Collectors' Institute (the link above), submitted by the former (and only) president of the Collectors' Institute, Jenkins Garrett. There, I learned that the Collectors' Institute existed from 1968 to 1980. It was, writes Garrett, "a private association of collectors of library materials, including books, manuscripts, documents, and maps, cosponsored by the Texas State Historical Association and the Harry Ransom Humanities Research Center of the University of Texas at Austin." As you read further, you realize this group collecting interest focused on some pretty interesting material and, to that end, invited some of the giants of Texas Belles-lettres, publishing, and book design to speak to the group. What an opportunity that was! Workshops were also held to address collector interests. The meeting's itinerary, presented in the program above, gives an indication of the what one could expect at these meetings. Looks like some pretty distinguished bookmen giving talks, conducting roundtable discussions, or being honored. Very interesting and educational, by all appearances. The group had twelve such annual meetings, but never met again after the 1980 meeting. I don't know why, perhaps interest waned toward the end. COLLECTORS' INSTITUTE. The Collectors' Institute was a private association of collectors of library materials, including books, manuscripts, documents, and maps, cosponsored by the Texas State Historical Association and the Harry Ransom Humanities Research Center of the University of Texas at Austin. It was organized on November 23, 1968, with more than 150 members. Between the fall of 1969 and 1980 twelve annual meetings were held, with programs of general interest in the area of publishing, authors, and collections. Speakers included Carl Hertzog, Hallie Stillwell, Lawrence Clark Powell, Archibald Hanna, J. Evetts Haley, and John Graves. In addition to annual meetings, workshops were held each spring. The workshop programs focused on questions of interest to collectors, such as identity, preservation, repair, and maintenance of printed and manuscript material. Through 1973 transcripts of the meetings were published and distributed to the membership. Jenkins Garrett was president of the Collectors' Institute from 1968 through 1980. From its organization in 1968 through the fall of 1970 Kenneth Ragsdale, a fulltime staff member of the Texas State Historical Association, served as voluntary secretary and coordinator of the institute. In 1974 John Payne, a fulltime employee of Humanities Research Center, volunteered to take over these responsibilities. He served through the fall meeting of 1980. The organization was discontinued after that meeting. 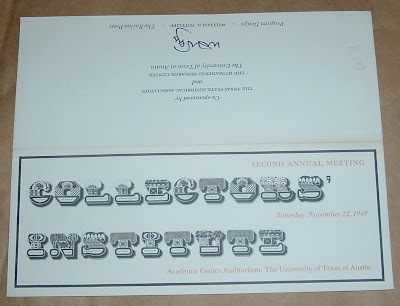 There was a good bit of ephemera at the Austin Book, Paper & Postcard Show last weekend (January 16-17, 2010). 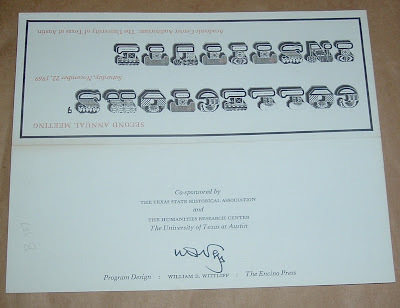 I didn't find any easily defined book trade-related ephemera (bibliophemera), but I did find something that might pass the test for this blog (looks like it passed--I'm writing about it): Two broadsides from the well-known book designer, printer, publisher, and retired library administrator, William R. Holman. His wife, artist Barbara Holman, illustrated them. Fame does not depend upon the majority. Great art is transmitted by the few to the few in each generation who know the permanent from the temporary. This is not snobbism; this is the way life is. As for printing, all that most people ask is that it be legible. That printing can also be art does not interest them. And yet when printing is of such perfection as to be called art, then does it last as long as paper lasts. 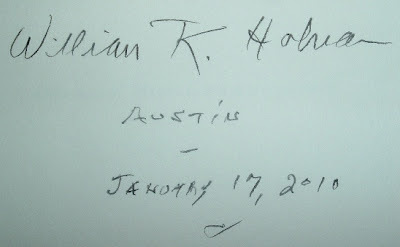 Meeting Mr. Holman was the highlight of my weekend in Austin. In fact, I went back to talk to him several times. He is a fascinating man, 83 years young, spry, and sharp. His name was only vaguely familiar to me when I heard he was there. Gratefully, that is no longer the case. Holman was at the show, set up as a dealer, selling a few books he and his wife either wrote, designed, illustrated, or published with Holman's imprint, Roger Beacham. Next to each stack of books was a stack of broadsides, a different design for each book. They had nothing to do with the books other than being offered as a premium for the purchase of a book. For each book purchased, you got a broadside from the stack next to the book. I bought one of each book, so I got one of each broadside. The books were Texas Beast Fables by Harold Billings (Roger Beacham, 2006), with illustrations by Barbara Holman and The Orphans' Nine Commandments, a memoir by Holman (published by the TCU Press in Fort Worth, 2007). This latter book is the most intriguing of the two in that Holman recounts his childhood adversities in orphanages and foster homes during the Great Depression before finally being adopted at age 13 under an 18th century "Indenture Contract." Indeed, his childhood has been compared to something out of a Dickens novel. Larry McMurtry called his story an important book and a compelling memoir. Holman overcame the odds against success and went on to become Director of the San Francisco Library and curator of the world-famous Harry Ransom Rare Book and Manuscript Center at the University of Texas in Austin. 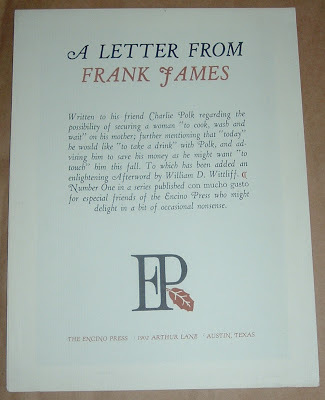 I've since learned that these broadsides are very collectible pieces of art from a book designer whose work, along with William D. Wittliff and others, continues in Texas the tradition of fine quality established by the revered printer Carl Hertzog. That link, by the way, is for an exhibit at the Cushing Memorial Library on the Texas A&M University campus. Nicholas Basbanes wrote a piece for Fine Books & Collections about his visit to Texas A&M and the Cushing Memorial Library last year. He was invited back a few months later to give a lecture at the library's Book History Workshop. Back to the broadsides... For the Larry McMurtry quote on the Cowboys broadside, I wanted to find out where that passage came from--which of his books--because I didn't recognize it, though I had a few ideas about where it could have come from. On my way to figuring it out, I learned that the broadside was created in 1988 for members of the re-established Book Club of Texas and given to members at their first meeting. I made an assumption that the passage was excerpted from a nonfiction work of McMurtry's, as the prose didn't seem to fit a fictional format. I first thought of Walter Benjamin at the Dairy Queen because that is the most recent of McMurtry's nonfiction books I've read. Then it hit me (at 4:45 this morning!) --it had to have come from McMurtry's first collection of essays. 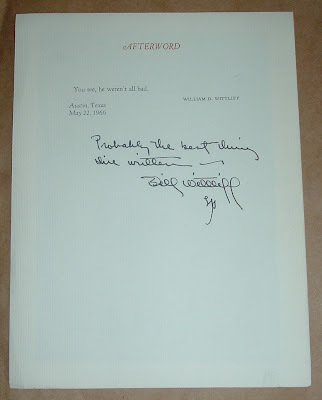 And there I found it, the last essay in the bunch: Take My Saddle from the Wall: A Valediction, from In a Narrow Grave: Essays on Texas (Bill Wittliff's Encino Press, 1968). Back to Bill Holman... After chatting with Bill (meaning I pretty much kept my mouth shut and listened), I bought one of each book, which he signed. He told me to get a broadside from each stack, I thanked him, and went back to my area to try to sell a few books. The cost of any lost sales while I was gone was more than compensated by meeting and talking with Bill Holman. A bit later, I thought I'd like to get my broadsides signed, so back over to Holman's table. He was reluctant to put his signature on the fine, hand-crafted paper for fear of defacing or ruining the broadside with the ink. I thought of a compromise and he agreed to very carefully sign the backs in pencil. The third time I went to talk to Mr. Holman, I wanted to ask him about the details of the broadsides--the hand-selected paper, the typography, and any other colophon type information he could share. He had told me earlier some of these details, but I couldn't remember them all. He was packed up and ready to go, although the book show still had another hour to go. Now he was having trouble remembering and made a joke about being 83 and his memory not being what it used to. He told me to email him about it; he had to go home now and go to work. "Work?" I asked. I had assumed his day was done for that Sunday. He informed me otherwise. One part of his day was done, now he was off to his writing job. He said he strives for 250 words a day in his writing. At some point, he gathers his writing and sends it to Larry McMurtry for critique. McMurtry sends it back and he resumes with editing and rewriting and more writing. I'm 30 years Holman's junior and can't seem to find the time (nor the discipline) to put down 250 words a day. I come close several days a week with my blogs, but everyday work and home responsibilities always seem to cut into that. Yet another reason to admire this man. As I stated before, these broadsides the Holmans created have become very collectible, commanding respectable prices. Mine are going to be prominently and proudly displayed in my office as both aesthetic decor and visual reminders of a serendipitous meeting at a book show with one of the best bookmen of a generation. Without really knowing it, unless through some intuitive mechanism, Mr. Holman enriched my knowledge and passion for this business and for this art. Isaiah Thomas was born on this day: January 19, 1749. H.H. 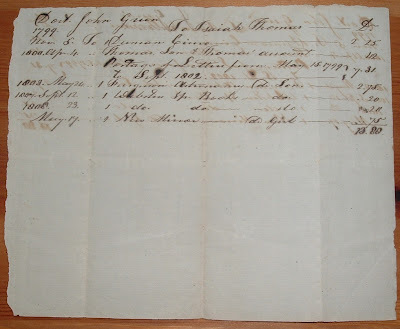 Cunningham is referenced twice in Isaiah Thomas' diary as having visited him from Montreal in May of 1811. Thomas wwas retired by this time, so the visit may have been social rather than business. About those two books Green bought, the following title seems to fit: Baron Steuben's Exercises, by H.C. Cushing, with the subtitle, Containing Militia Laws of the United States (1792), and of the State of New York (1801), with Instructions and Regulations for the American Army in the Revolution. What follows is copied from the American Antiquarian Society's Web site. 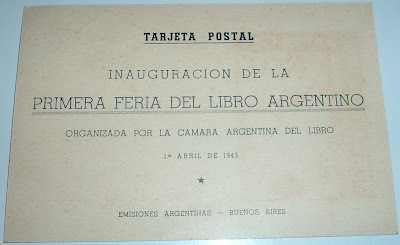 As I finally reach the century mark on this blog with this post, I thought I'd post a few pieces of ephemera in observation of book fairs. The subject is timely because I'm headed up to Austin with a truckload of books to do the Austin Book, Paper & Photo Show this weekend. The preceding link shows six images from last year's show. I didn't make the cut, but my wife did--our exhibit barely shows up on the far-right side of image 4/6. We were off in a side room, but hoping for a more visible spot this year. Here are some images that make my cut for today's post. Actually, they are all I have on the subject, but I'm always on the prowl for more. And who knows what will turn up in the Texas Hill Country? What I have here are post cards and postal covers that commemorate various international book fairs (nothing close to home). First up, from India, is my favorite of the bunch because of its colorful display of an active image of people interacting with books. Also, the art work was done by a 13-year-old, Kumari Pampa Paul. Nice to have a representative of the intended readership of the fair's books actually do a painting for the fair's advertising. This is a First Day Cover, so called because the accompanying stamp was officially issued on the date indicated by the postmark. Also, the designation First Day Cover is on the front of the envelope. Because this was designed for collectibility, it probably does not fit within the definition of ephemera and belongs in a stamp collecting category, but covers are part of my collection, so I'll blur the lines now and then with items like this. 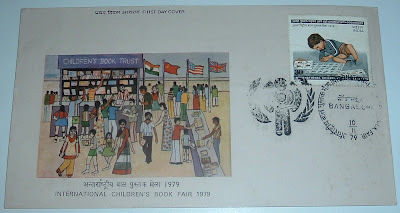 The title of the cover illustration is Book Fair and it commemorates the International Children's Book Fair of 1979. Next are two covers from Israel commemorating two different book fairs. 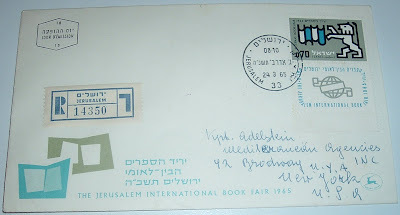 This one (immediately below) is a specially designed cachet for the Jerusalem International Book Fair of 1965. 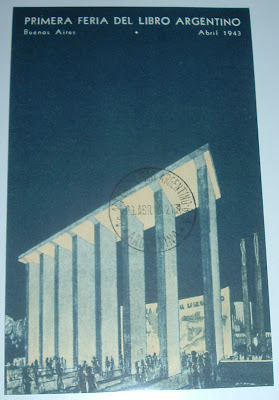 As with the India cover above, the postage stamp also commemorates the fair. I featured this cover back in September in a post titled, Books in Israel. 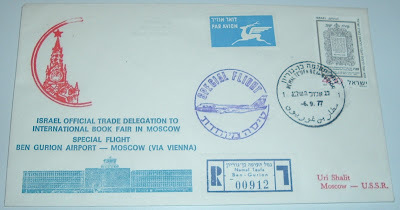 In this post, the Jerusalem cover has a companion piece of sorts with the Israel Official Trade Delegation to International Book Fair in Moscow cover that also sports a special flight postmark--Ben Gurion Airport to Moscow, via Vienna. The mix of Russian and Israeli symbols and graphics makes for an interesting postal cover. I'm not sure of the date, but it appears to be 1977. If so, this would be the First International Book Fair in Moscow, 9/6/1977-14/1977. I have found reference to the Association of Jewish Book Publishers having attended this fair, so the cachet probably commemorates this historic fair. The name Uri Shalit appears in the lower-right corner, followed by Moscow--U.S.S.R. There is a Uri Shalit, President of the Israel Stamp Dealers' Association and a Uri Shalit, neuroscientist, in Israel. I think the stamp collector is the likely sender of this cover. He probably never imagined it would wind up in Texas. 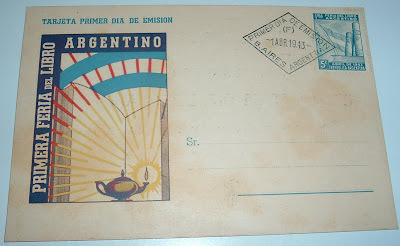 Finally, we head south, way south, to Argentina for a couple of post cards advertising the first book fair in that country--April 1943. Each is shown with images of the front and back of the card. 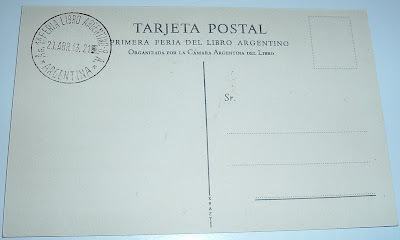 The first post card features a postage stamp and cancellation to commemorate the Primera Feria del Libro Argentino. If you collect books about America, you collect Americana. Focusing on a particular state, such as Texas, collectors and sellers of books about the Lone Star State, such as myself, deal in Texana. It’s easy to classify your geographic collection or interests with the ana suffix, where it fits and sounds okay. Sometimes you need another vowel to help with the transition, such as the letter i. Floridana doesn’t work for Florida, but Floridiana (accent second syllable) gets the job done. I came across this elegant little bookplate bearing Delaware's state seal in a small, slim volume with the title, Wilmington Country Club 1936. 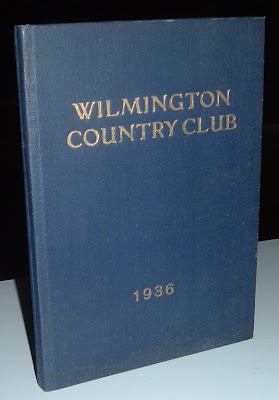 Its a book of by-laws and rules, as well as a directory of members for the Wilmington Country Club in Wilmington Delaware. A quick Internet search of Groves' name turns up a handful of books for sale that bear the same Delawareana bookplate as above, but surprisingly little information on the collector. 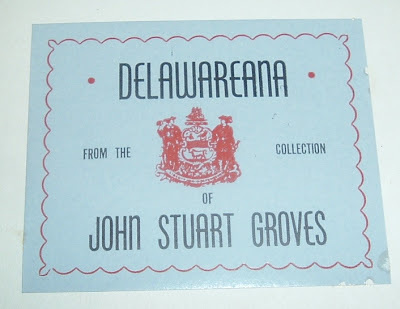 John Stuart Groves was obviously a collector of Delaware history, but he also collected Lincolniana (there's that i transition again) and helped supplement the collection of the Lincoln Club of Delaware, which was donated to the University of Delaware Library in 1972. I also found Grove's name in the Wilmington Country Club book, listed as one of two Chairmen of the Members Committee in 1936. As for his books, it would appear that they have been scattered hither and yon. I would have liked to have discovered his collection, or the majority of it, intact, residing in a Delaware library, as did his Lincoln collection. Perhaps it wasn't big enough or important enough a collection for a library's holdings. But it appears to have been an interesting and special enough collection to Groves, warranting a custom bookplate. So today where would Groves or any collector of books about Delaware go to find them? Start online with the Collecting Delaware Books site, a digital collection of print newsletters discussing Delaware books and paper ephemera, published from 1992 to 1999 by John P. Reid of Bear, Delaware. Wrapping up, here's a quick American history lesson: Delaware is known by the nickname, the First State because it was the first state to ratify the U.S. Constitution in 1787. Thus, Delaware became the first state in the newly formed United States of America. I'll bet John Stuart Groves had some interesting material on that! I was never a math and science whiz, but I like this bookplate, which appears to have belonged to a math and science whiz. I like it for the design and a particular memory it evokes from my high school days. Sometime around 1974, I had to take a Chemistry class and we had to learn how to make computations on a slide rule. In the bookplate, you'll find a slide rule in the middle of the design, laying across part of the book. Does anyone still use these things? Don't know, but further down you'll find a link about how to use them if you want to. 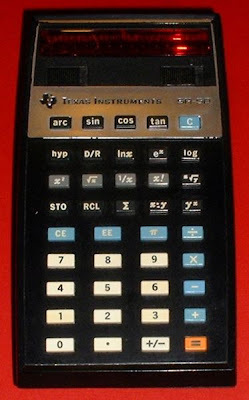 At that time, Texas Instrument calculators were popular and some of kids had them. I remember wanting one so bad--the TI SR-50--but it was too expensive. The SR-50 was high tech and very cool for then. It had all these functions on it, which I had no idea about, but I liked knowing that I could have them. And I could have had them for $170, according to the Wikipedia page on the TI SR-50. I remembered it being too expensive and out of my reach, but I was remembering about $100 short. Man, $170 for a calculator? It blew my mind then and still does today because of how unbelievably cheap these things are now. Today, you can find vintage calculators at where else? The Vintage Calculator Web Museum. Slide rules? You knew there had to be a place... Go to sliderulemuseum.com (again, where else?). There's even a page on this site that will teach you how to use them. Here are a couple of 1880s post cards from Blakiston, Son & Co., publishers and booksellers of Philadelphia, located at 1012 Walnut Street. Medical and scientific books were a specialty, as these mailers indicate by the books they advertise. 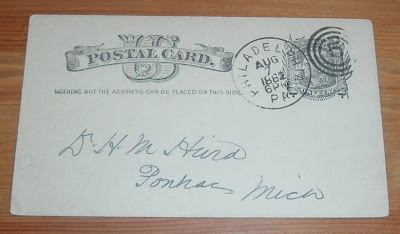 Both cards are addressed to Dr. Henry M. Hurd at the Asylum for the Insane in Pontiac, Michigan. 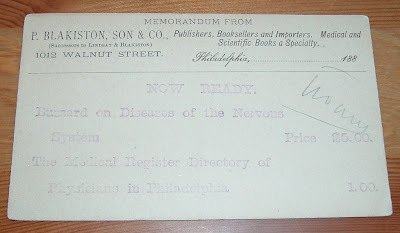 The earliest of the two cards, above, was sent to Dr. Hurd in 1882 and advertises two books that may be of interest to him in his practice: Buzzard on Diseases of the Nervous System and The Medical Register Directory of Physicians in Philadelphia. 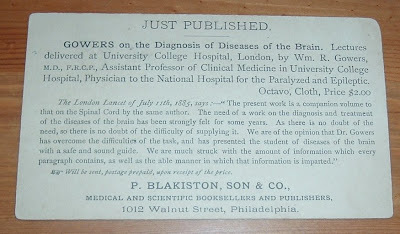 The next card, below, advertises the "just published" GOWERS on the Diagnosis of Diseases of the Brain, a series of lectures delivered at University College Hospital in London, by Dr. William R. Gowers. 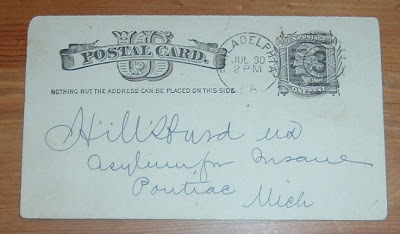 The post mark does not include the year, or it has worn off, but there is a brief review of the book and author by the London Lancet, dated July 11th, 1885, which helps date when the card was sent. Best guess is that the card found its way to Dr. Hurd later in the same year. Research led to this Roots Web (genealogical) site. The historical focus here has an architectural or design angle, as indicated by the site's inconspicuous title: America's Vanishing Historic Kirkbride Asylums, Other State Hospitals, Sanitariums, County Homes, Medical. This web site is an attempt to catalog and present America's historic psychiatric hospitals (state hospitals; insane asylums) founded mostly in the latter half of the nineteenth century. The site gives special emphasis on the facilities built on the "Kirkbride plan", but it is not necessarily limited to the Kirkbride hospitals. The Kirkbride plan and the resulting buildings represented great ambition on the part of both psychiatric caregivers and architects. Kirkbride is Dr. Thomas Story Kirkbride, who assisted the architects of the asylum buildings in designing the basic floor plan used in many of these buildings. Dr. Henry M. Hurd, the recipient of the Blakiston publisher's cards above, was the first director of the Pontiac asylum, which opened in 1878 and was known through the years by several names, including the Clinton Valley, Eastern Michigan Asylum, Eastern Asylum for the Insane, and Pontiac State Hospital. The image of Dr. Hurd, as well as those of the hospital where he worked (below) are from the Roots Web site and offer an historical postcard view and a more recent photographic view of the "asylum." There are many links on this page about this particular facility in Pontiac where Dr. Hurd worked. They include a variety of post card and photographic images of the "insane asylum." What qualified for "insane" back then could have been a number of things, many of which would have completely different diagnoses today. Certainly, some people were institutionalized because of perceptions, prejudices, and ignorance of the day. But there were many who were mentally ill and in need of treatment. Though this period is partially characterized by the darker aspects of institutionalizing patients and their sometimes questionable or abusive therapies, it also marks a movement of sincere effort to learn about and improve the field of psychiatric diagnosis and care. These post cards offer a tiny window into the literature of the day on this topic. They also led me to an interesting site that delves into the history of the treatment of mental illness in this country through the many facilities that were developed during the nineteenth century.